People ask me all the time why I’m vegan. It’s an understandable question - I’m sure for many of them, I’m the only vegan they know. While veganism is gaining a lot of attention nationally and the number of people eating plant-based diets is growing like crazy, it is still a definite minority, and one that is mostly associated with angry PETA activists and pot-smoking hippies. I LOVE that I don’t fit the typical vegan mold, and I get really excited to talk to people about it. But I also get stage fright. It’s a lot of pressure to be the sole representative of something, especially of something that’s so close to my heart. Disappointingly, I usually end up downplaying the depth of my conviction for the sake of being inoffensive, brief, and to avoid seeming too much like a crazy hippy-activist. So for the sake of my own clarity, I thought I would write out an explanation for why I am a vegan and how it’s impacted my life. I’ve always been a tad bit squeamish about meat - pork and raw chicken in particular have always grossed me out. I also had a few lovely roommates in college who are vegetarian, so I was exposed to the concept of a meat-free diet for a good long while. I always thought it was interesting (and knew by the ever-present spinach in our college fridge that they were eating pretty healthfully!) but never really investigated the dirty deets of what/why/how. I think I knew that if I really explored the idea of vegetarianism, I would face some pretty harsh realities about animal treatment, so I just avoided learning about it. But a couple of years ago, after spending a weekend with my lovely vegetarian friends Lauren and Chris, I started talking more seriously about the idea of going vegetarian. Meanwhile, my sweet husband was tracking down some podcasts for me to listen to during my commute, and added one to my iPod that seemed fairly harmless - along the lines of “5 Ways to Cook Chickpeas” or something. Unknown to either of us at the time, the author of the podcast is a vegan, and while I did learn about chickpeas, I also learned a LOT about the treatment of factory farmed animals - the torture that chickens and cows and pigs experience during their lifetimes as well as their slaughter. I was exposed to a lot of information about the dairy industry, the cruelties that those sweet Borden cows are subjected to, and the ties between the dairy industry and the veal industry. Most importantly, I heard for the first time about another way to eat - one that could free me from ignoring exactly what I’m touching when dressing a Thanksgiving turkey, or what I’m chewing when I bite into a burger. For me it really was truly eye-opening - there’s a reason I’ve been uncomfortable handling raw chicken or eating rare steak! I’ve always loved animals so it makes sense that at my core, I’m uncomfortable eating them. And to learn that you can have a tasty, satisfying meal without animal products (and that it wasn’t all alfalfa sprouts and carob) was kind of a revelation. So... I just stopped. I really wasn’t planning to quit meat cold-turkey (haha), but I just couldn’t bring myself to eat the leftovers in the fridge. I spent MANY a night bawling my eyes out to Cody, wrestling with my emotions about the realities I was learning about animal treatment, but also my desire to not be a wierdo, and maybe I’m just being too sensitive, but also I JUST CAN’T EAT MEAT ANYMORE! Cody was wonderful, never once getting defensive or frustrated or even worried about what this meant for his future hot dog consumption. He has since told me that he felt the Holy Spirit moving in him during those weeks, telling him that this is a holy conviction for me, so instead of fighting back he encouraged me to follow my heart and to live according to the convictions that I felt were being so strongly impressed upon me. As I did further research, I decided that as an ethical vegetarian, I really should cut out dairy and eggs as well. (I flirted with eggs for another year or so, sourcing from a free-range farm that I felt was a step ahead of others, but I’m now basically off of eggs as well.) It took about a month from my last bite of meat until I was 100% off of dairy. My last bite of meat and cheese was two years ago this month, and I can’t tell you how great I feel! How LIBERATING it is to know that I’m making a choice every day, at every meal, to live in line with my values. To walk through HEB and just totally bypass the meat and cheese section. To try things like tempeh and kale and nutritional yeast because a whole new world of cooking has opened up to me. To watch documentaries like Forks Over Knives and read books like Diet for a New America and know that the things I’m learning about nutrition and disease prevention and the environment all align with the way I’m choosing to feed myself and my family. To know that because of the choice I’ve made for my family, no animals would be harmed or killed on my behalf. There’s a lot (LOT!) more I could say about being vegan. About the health benefits that I’ve personally seen and that truckloads of research supports. About the deliciousness that is tofu (for real). About how much more I now enjoy cooking, and perusing blogs and Pinterest for new recipes. About going through pregnancy, natural childbirth, and breast-feeding without eating animal products. About the challenges of finding non-leather shoes. About eating lentil loaf for Thanksgiving dinner. :) It’s been a wild ride and I’ve had so much fun learning and experiencing so many new things. But all of that is secondary. Because the real reward of veganism is the peace I’m walking in, knowing that I am following a conviction that God has impressed upon my heart. The book of Jeremiah talks about the Rekabites, a group of people in the Bible who abstained from drinking alcohol because of a calling of their forefather. God honored their family’s commitment to their conviction in a big way, blessing them and saying that “Rekab will never fail to have a descendant to serve me.” Of course, not everyone is called to abstain from alcohol, but we each have certain convictions that we feel weighty in our hearts. Those aren’t there by accident - it’s the Holy Spirit’s prompting! I’m so grateful that I stopped turning my back on this particular call in my heart. Facing the realities of the suffering that is associated with our food culture is scary and overwhelming at first, but knowledge really is power, and there are tons of resources out there that can educate you and empower you to change your dietary habits. If any of the things I’ve mentioned piqued your interest, I would just encourage you to explore the idea more for yourself and PLEASE feel free to talk to me about it. Like me, you might be surprised to find that becoming a vegan is one of the most joyful decisions you’ll ever make!! I love this beautiful sparkly navy dress! It reminds me of a real life version of the dress from the cartoon Anastasia, which I dreamed about wearing to my senior prom. My choice ended up being similar in color and sparkliness, but not nearly as glam as this dress on the stunning/hilarious Leslie Mann! I freaking love how perfectly this dress matches Ellie Kemper's gorgeous hair color! The bead work is beautiful and the accessories are so perfect - it just all makes me so happy. :) Plus it makes her figure look amazing. BUT her bangs are DRIVING ME NUTS! How can she stand them at that terrible resting-on-your-eyelashes length?! If I had olive skin and beautiful dark hair, I would wear this color all the time. However, this seafoam-olive is probably in my top 5 Colors That Make Me Look Like Death. So it's always fun to see someone pull it off so beautifully. I think her hair and those amazing earrings perfectly complement this flowy foamy dress. Way to rock it, Maria Menounos! I'm a pretty traditional gal, and if I ever wen to the Oscars (ha!) I would definitely go classy over edgy or bold. But of all the dresses that I would consider "risky," Nancy O'Dell's bright yellow gown is my fav. I love seeing blondes rock yellow like this. Though, in general, I'm not a fan of this much cleavage. Haven't you heard that modest is hottest, Nancy? I cannot say how much I love this 50's vintage polka-dot gown on Natalie Portman! She looks just stunning, and it's accessorized perfectly. I would love to wear this dress! Maybe a tea-length version? Sigh. I'm not really digging Natalie's hair here, but I'll forgive it because everything else is so perfect. Silver is another color that just makes me look terrible. And somehow I keep wearing it (sophomore homecoming, bridesmaids dress, and most recently, my brother's wedding - what was I thinking?!) But this color looks so beautiful against Octavia's skin! And I love how the beadwork on the dress accentuates her hourglass curves. Most formal gowns wouldn't do such a good job of playing to her strengths, but this one totally does! I think Tina Fey is so so beautiful, but this dress is super boring! It looks like a mother-of-the-bride dress from David's Bridal! I do like her eye makeup though, and the color looks good on her. 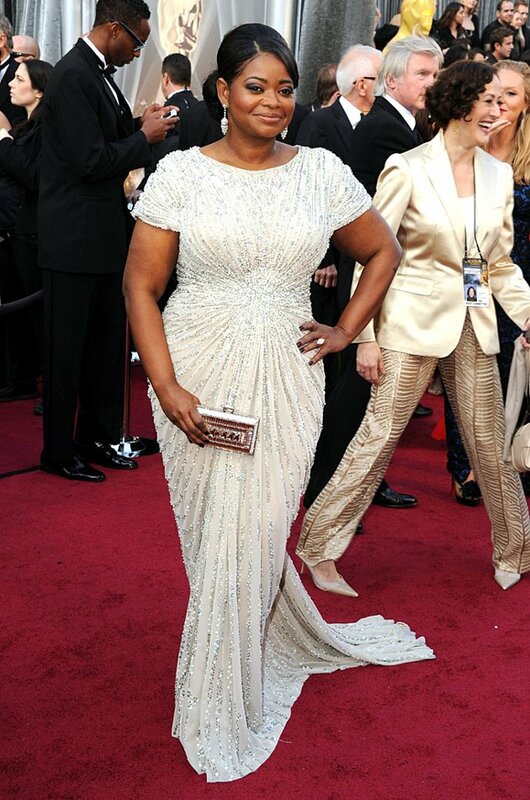 But I think she played it way too safe and ended up looking matronly and blah. Tina certainly wasn't the worst-dressed - not by a long shot - I just know she could do so much better. I think Angelina is looking a bit too skinny here, but hot dang, she is working that dress! I love the way she lets her beautiful hair & face (and leg!) be her accessories instead of distracting with jewelery or a handbag. I usually think that Brad Pitt is the better-looking one in the pair, but tonight Angelina blew him out of the water! Emma Stone looks just perfect in this awesome gown! It's the ideal balance of youthful and classic - I mean, that bow!! I particularly love that this dress isn't one you'd see worn outside of a red-carpet event - the proportions are just too much for a "regular" person to wear for any special occasion. But it's perfectly Oscar-worthy and suits her to a T. And I totally love when red-heads wear red - the color looks amazing on her and re-affirms for me why she's the current Hollywood it-girl. Bring vegetable broth to a boil in a medium pot. Add couscous, stir and cover. Simmer for 8-10 minutes or until couscous is al dente and water is absorbed. Add the black beans, bell peppers, avocado, corn, and scallions to the dressing and toss all together. Season with more salt and pepper if desired. Sprinkle a bit of chili powder and add cilantro at the end. Toss again and refrigerate to let the flavors blend. Serve chilled or at room temperature (my favorite). This recipe is super adaptable. Change up the amount of spices in there as you see fit. You can bulk it up with another can of beans, or reduce the amount of couscous to lower the carbs. I like to use whole wheat couscous when I can find it. Cody likes to eat this on tortilla chips, but I think it's awesome straight from a bowl. I hope you enjoy it!! Once the nursery was ready, and we were getting closer and closer to the birth of our daughter, I had one recurring, nerve-wracking thought: “Please don’t come in the middle of the night.” Every night that we were still awake at 11, I worried that Chêz would look at me nervously and say, “I think it’s starting.” We had already taken a 10-week class on natural childbirth, and Chêz had read a couple books on the subject, so I felt comfortable that we were as prepared as we could be for the labor and delivery. But the timing was completely beyond our control. Little Eliza would come when she was ready. So that’s what I was most worried about. Not a painful birth; not an unhealthy baby; not the parenting that would come soon afterward. I didn’t want to be sleepy. Our January 2nd due date came and went, and although we knew intellectually at that point that we could become parents at any moment, I’m not sure we actually expected it to happen. I have an amazing (dangerous?) ability to live in the moment and not look too far down the road. So I was content to live in our existing state: Chêz being pregnant and not all that uncomfortable, and me going to work, coming home and rubbing her feet. But Eliza was determined to shake things up. Shortly after midnight on the morning of Jan 8th, Chêz woke me up to say, “I think my water just broke.” One of the main points I took away from our birthing classes was this: “Labor is a long process. Don’t immediately rush off to the hospital the first time you feel a little twinge in your belly.” Following that thinking, I gave her my best, half lucid advice. “Try going back to sleep,” I said. So we both tried to sleep – me successfully; her, not so much. She woke me up after about 30 minutes to say that she couldn’t go back to sleep. I swung my legs over the side of the bed, rubbed my eyes, and geared up for the long day ahead. Knowing that she wouldn’t be able to eat anything once the labor pains really ramped up, I offered to make her some eggs. She meekly consented, even though I could tell she was disgusted by the thought of food. She was nauseous after only a couple bites, and she threw up soon after, which made me feel sorry for forcing the food on her in the first place. Based on what we had heard and read, we were expecting labor to start lightly and continue that way for several hours. We had made a list of our favorite Friends episodes that Chêz thought she would want to watch during early labor. Also, she had made some cookie batter (vegan, of course) that she wanted to bake and take to the hospital nursing staff. What seemed like perfectly reasonable ideas the night before now appeared utterly preposterous. Even in her laboring state, she asked me to prepare and bake the cookies, which I gently suggested was a very bad idea. For the next 3 hours, Chêz labored at home while I packed the car and comforted her when I could. Her level of focus was amazing. She would lie on the couch with her eyes closed until a contraction came, then roll onto the birth ball where she would rock until the contraction passed, and then roll back onto the couch and rest. She was in her own world. I tried to help, but mostly I was just staring at her with a stopwatch in my hand, trying to figure out when the pain started and ended – like I was gathering data for a weird, sadistic research paper. Even though I had “been prepared” for this, I felt totally out of my depth, so I contacted our doula, Julie Hagey, and asked her to come quickly. While we waited on Julie to arrive, I continued to prepare for our departure to the hospital. Chêz’s contractions were consistently seven minutes apart, so I figured we had hours until things would get really intense. And then one contraction jumped under 5 minutes, followed by another one. Uh oh. I quickly finished our preparations, told Julie we would meet her at the hospital and helped Chêz to the car. Despite my careful driving, Chêz could feel every bump and crevice on the road, and was very uncomfortable during the short trip. We arrived at the hospital around 6 am, so we had to go through the ER entrance. We waited until Chêz was between contractions before leaving the car and heading through the automatic sliding doors. We brought the birth ball, which Chêz immediately collapsed onto as we entered the ER waiting room. The first nurse to come to our aid was more than a little freaked out. She asked, “Why did you wait so long to come in?” I was a little put off by her question, but I was focused on Chêz and getting her to Labor & Delivery as quickly as possible. Soon, we were wheeled up to the L&D wing by a much nicer nurse, where they checked on Eliza, who showed no signs of distress. Chêz continued to labor without too much trouble while we waited for our doula, Julie, show up. I was starting to feel impatient, and I privately muttered, “When Julie gets here, she better earn her money.” Shortly after that uncharitable thought, she came in the room, and I’m happy to say she was an enormous help throughout the rest of the process. I was applying counter pressure to Chêz’s back, and Julie thankfully took over to give me a break around 6:45. The initial adrenaline rush produced by the trip to the hospital was tapering, and I was feeling the effects of missing a night of sleep, so I went down the hall for some coffee. I came back into the room, coffee in hand, and sat down next to Chêz, ready to help. I hadn’t even taken a sip when her next contraction hit. She took a deep breath, grimaced, and yelled “You smell like coffee! Get away!” I dutifully but sadly poured the whole cup down the drain. Fortunately, Julie came to the rescue with some caffeinated tea that met my need for quick energy and Chêz’s need for odorless beverages. Chêz was composed and mostly quiet as Julie coached her through each contraction. After an hour of uneventful laboring, a new nurse came into the room to attach the fetal monitor and check on our progress. What had been a calm environment soon turned chaotic as the new nurse inverted the bed so that Chêz’s head was lower than her feet, which was clearly very painful to her. At one point she eked out a tiny “help!” which made me feel utterly feeble as she struggled. The nurse started spewing medical jargon at Chêz as if she had any hope of comprehending it in her current state. The nurse said that the baby was experiencing some “decels” (heart decelerations), and I heard her mention the possibility of a C-section. I didn’t really understand what was going on, and for the first time, I was scared. I tried to get the nurse to talk to me, but she stubbornly continued trying to communicate with Chêz instead. Dr. Monteiro, our OB, soon walked in the room and said, “I think everyone needs to chill out.” He checked on the baby, told the nurse that she was overreacting and cleared the room. Thank God. With order restored, only Julie, and our primary nurse, Michelle, remained in the room with us. A wave of relief washed over me as we continued to coach Chêz through her contractions. We later learned that the panic was completely unjustified. They were having trouble getting a reading from the baby because she had progressed much further than they thought, and shortly after 8 am, Chêz was ready to push. She wasn’t prepared for how physically taxing the pushing would be and I could tell she was tired and discouraged. “You’re doing so good,” I kept saying, but she doubted her progress. After only a few pushes, I could see the top of our little girl’s head. Suddenly I was struck by the gravity and the beauty of what was about to happen. I focused intently on Chêz, held her hand, and gently kissed her forehead. Everyone and everything faded away as I showered her with love and praise, both of our eyes welling with tears. I told her I loved her, that I was proud of her and that she was an immense blessing to me; I thanked her for being my wife and for loving me; I told her she was going to be an awesome mother, and that we would be seeing our daughter soon. When Chêz and I were dating, she told me about the idea of “eternal instants”. Moments that are fleeting, but frozen in time because of their lasting significance. This was an eternal instant. In real time, it was probably no more than a minute, but I still feel the resonance of that moment. Time began to speed up as the next contraction came along. The doctor entered with a gaggle of nurses and other staff as we all prepared for Eliza’s arrival. Chêz was still exhausted, but she was focused and determined, knowing that her daughter would soon be in her arms. With one final push, Eliza fully emerged into the arms of our doctor. She was quickly brought up to Chêz’s chest where we embraced for the first time as a family of three. We held our daughter tightly and sobbed, completely overwhelmed by the moment. She was here; she was perfect; she was…purple. Is she supposed to be purple? The doctor wasn’t worried about it, so I figured it must be fine. Sure enough, she began to turn a lovely shade of pink after she was bathed and wrapped up in towels to keep her warm. Also, sorry about the jacked up formatting. Blogger is so annoying about this stuff. Much like Microsoft Word, which has THE most annoying formatting settings ever. This is the kind of thing that totally stresses me out and would normally keep me from publishing the post, but I'm going to let it go. Especially since I think basically no one reads this blog anyway! Haha! Adapted from a recipe from my Better Homes and Gardens cookbook. Preheat oven to 425. Put tomatoes in 8x8 square dish or 9" pie plate. Cover and microwave for a few minutes to get the tomatoes started. Meanwhile, combine panko, nutritional yeast, garlic, pepper, salt & parsley in a small bowl. Stir in the olive oil and mix well to distribute. Spread evenly over the tomatoes and bake until browned, about 20 minutes. Recipe by the amazing Mama Pea, who blogs at peasandthankyou.com. Check out her website and her cookbook (by the same name) for a wealth of kid-friendly vegan recipes! Wash kale & pat dry. Remove the thick part of the stem, then gather leaves into bundles and cut across in 1/2" strips. Put in a large salad bowl. Whisk together all the other ingredients. Adjust the seasonings to taste. Pour over the kale and massage with your hands to soften the kale. Refrigerate at least 5 minutes (or several hours) before serving to allow kale to soften more. Recipe by Dreena Burton from Eat, Drink & Be Vegan. In a large pot on medium heat, add oil, onion, celery, garlic, dry mustard, salt, and pepper, and stir to combine. Cover and cook for 6-8 minutes, stirring occasionally. Add 4 cups beans, stock, water, and rosemary, and increase heat to bring to a boil. Once boiling, reduce heat to medium-low, cover, and cook for 15 minutes. With a hand blender, puree soup until smooth. Or carefully transfer soup to a blender & blend, then transfer back to pot. Stir in remaining 2 cups beans and lemon juice. Season with additional salt and pepper if desired. Serve in individual bowls, topped with a handful of Jumbo Croutons and drizzle of olive oil if desired. Preheat oven to 400. Using a sharp knife or a pizza cutter, cut bread slices into 1" squares. In a large bowl, toss cubes with oil. Line a baking sheet with parchment paper, and transfer bread onto sheet, then sprinkle with salt. Bake for about 12 minutes, tossing once or twice throughout, until lightly browned. So once again it's been over a year since I've blogged. Whoopsie. Since then I've quit my job, watched my huddle kids graduate, and had a baby girl. :) I may or may not blog more about some or all of this stuff, but I thought I'd use the blog to post a few vegan recipes that I've been enjoying. I am NOT a vegan who never liked meat or dairy much to begin with - I really loved cheesey pizza and creamy ice cream and even steak back in the day. So when I look for vegan recipes, I don't really like things that try to be like non-vegan food but don't live up to it. I'm not too good for soy yogurt and gardenburgers (just ate one for lunch, actually! ), but if I'm going to cook I want it to be something that tastes good on it's own merit, not because it reminds me of chicken. Anyway. Here are a few recipes that I made recently for a dinner party. I hope they inspire you to give them a try! Recipe by Dreena Burton from Eat, Drink & Be Vegan (my first and favorite vegan cookbook!) This has a unique taste because of the cocoa, coconut milk, and lime, and the coconut flakes add a fun texture. There are a million vegan chili recipes and you pretty much can't go wrong with beans and tomatoes, but this one is by far my favorite. In a large pot on medium heat, add oil, onion, celery, peppers, garlic, salt & pepper, chili powder, cinnamon, and allspice, stir to combine. Cover and cook for 7-9 minutes, stirring occasionally; reduce heat if onions or garlic start to burn. When onions start to soften, add cocoa and stir for 1-2 minutes, then add tomatoes, beans, coconut milk, and coconut, and stir to combine. Increase heat to bring to a boil. Once boiling, reduce heat to low, cover, and simmer for 20-25 minutes, stirring occasionally. Stir in corn kernels and cook another 5 minutes to heat through. Remove cover and let liquid reduce if desired. Serve with lime wedges and squeeze on generous amounts of juice. Makes about 9 one-cup servings. Recipe adapted from Dreena Burton's Eat, Drink & Be Vegan. I sometimes substitute a frozen mix of corn, black beans, onion, bell pepper and serrano peppers (from Randalls) for the second 1/2 cup of frozen corn. Preheat the oven to 375. Mix flax, milk & 1/2 cup of the corn in a food processor or blender until smooth. Transfer to a bowl and stir in remaining corn kernels, applesauce, and oil. Sift in dry ingredients & stir until just combined. Spoon into a lightly oiled muffin tin and bake 22-25 minutes, or portion out with cookie scoop into mini-muffin tin and bake for about 20 minutes. Makes 8 regular muffins or squares, or 24 mini muffins. Recipe by Robin Robertson in Vegan on the Cheap. This cake is pretty dense, not light and fluffy like a birthday cake. Preheat the oven to 350. Lightly oil a 9" cake pan, sprinkle with 1/4 cup of the walnuts, and set aside. In a medium skillet, melt the margarine over medium heat. Add the apples, 1/2 cup of the brown sugar, and the lemon juice and cook, stirring to soften the apples and dissolve the sugar, for 3-4 minutes. Remove the apple slices from the pan and set aside to cool. Reserve the liquid in the pan. When the apples are cool enough to handle, arrange them concentrically on top of the walnuts in the cake pan. Sprinkle with the remaining 1/4 cup walnuts. In a food processor or blender, grind the oats to a fine powder. Remove the oats and put in a bowl. Add the beans, oil and vanilla to the food processor. Add 1/2 cup of the reserved apple juice (if there's not enough, add water to reach 1/2 cup). Blend until smooth. Add to bowl with the oats. Stir in the flour, remaining 3/4 cup of sugar, baking powder, cinnamon, and allspice and combine thoroughly. Spoon the batter into the prepared pan and carefully spread across the top of the apples & walnuts. Bake until golden brown, about 35 minutes. Let the cake cool for about 30 minutes, then run a knife around the sides of the cake to loosen. Place a plate on the top of the pan and invert, carefully removing the pan to reveal the apple slices as the top of the cake.